Fairlawn’s Ashley Roush works to hold onto the ball as Jackson Center’s Ashley Mullenhour and Elizabeth Hickey try to strip her of it during a Shelby County Athletic League game on Thursday at Fairlawn. Fairlawn’s Lonna Heath works past Jackson Center’s Chloe Reese during a Shelby County Athletic League game on Thursday at Fairlawn. Fairlawn’s Lauren Dudgeon and Jackson Center’s Raquel Kessler battle for ball control during a Shelby County Athletic League game on Thursday at Fairlawn. 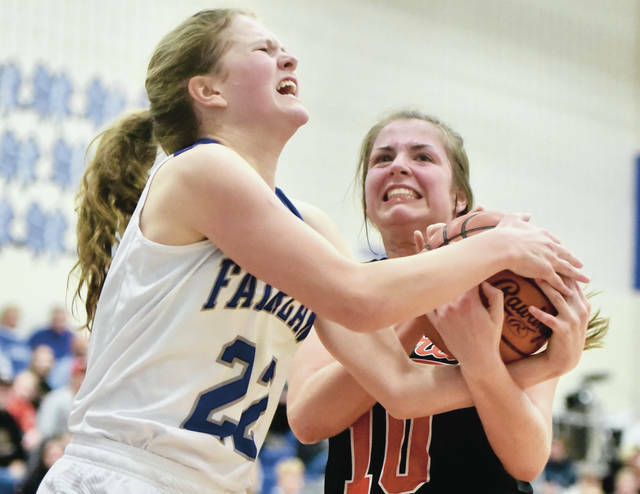 SIDNEY — Fairlawn’s senior night started about as bad as could be imagined but ended with a dramatic come-from-behind victory. 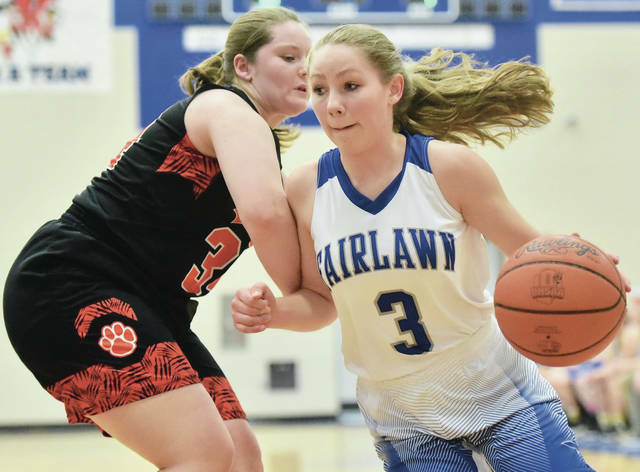 Fairlawn battled back from an early 14-point deficit and beat Jackson Center 46-45 in a Shelby County Athletic League on Thursday at The Hangar. The victory (combined with Botkins’ lopsided loss to Fort Loramie on Thursday) earns Fairlawn sole possession of fifth place in the SCAL. That’s quite an improvement for the Jets, which hadn’t won an SCAL game in two seasons before this year. The game was the regular-season finale for the Jets (7-15, 4-8 SCAL). They’ll open tournament play on Feb. 19 against Triad at Sidney High School. The Cardinals are the No. 9 seed in the Sidney Division IV sectional while Fairlawn is No. 10. Jackson Center led 16-2 early but Fairlawn finished the second quarter on a 13-4 run to pull within 26-23 at halftime. Kennedy Spicer made a 3 to start the third quarter and tie it up. The teams traded points to a 31-31 score, then the Jets took their first lead of the game with 1:27 left after Lonna Heath made a layup after a steal. Jackson Center junior Kylie Hartle made a basket with 5:36 left in the fourth to tie it 37-37, but Heath made a pair of free throws to put the Jets ahead a little later. The Jets held the lead until a dramatic final minute. Hartle made a 3 from the left wing with 53 seconds to bring Jackson Center within 44-43, then Fairlawn missed a pair of free throws. Raquel Kessler made a put-back with 12 seconds left to give Jackson Center a 45-44 lead. After a timeout, Heath was pushed in the back by a Jackson Center defender shortly after an inbounds pass and made 2-of-2 free throws to give Fairlawn a 46-45 lead. The Tigers got the ball down in the left corner but missed a 3 at the buzzer. Jackson Center dominated the first quarter. Ashley Mullenhour hit consecutive 3-pointers in a 30-second span to put the Tigers ahead 14-2 by the midpoint of the quarter, then Kessler made a basket in the paint with 2:24 left and a free throw with 1:37 left to push the lead to 19-5. 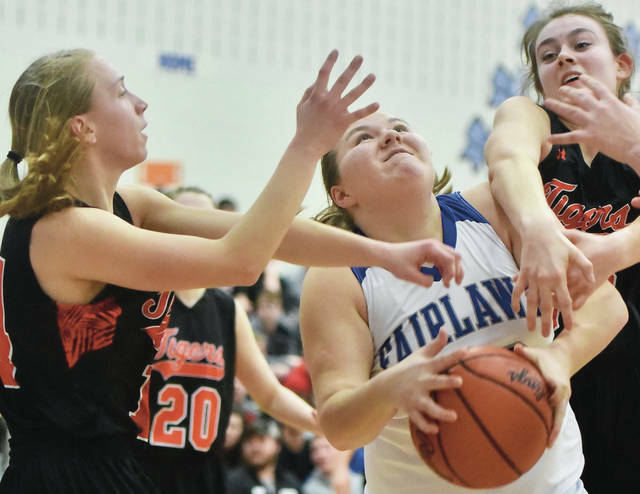 Fairlawn senior forward Lauren Dudgeon made a basket to cut the gap to eight points with 2:37 left in the second but Kessler made two free throws a short while later to push the advantage to 24-14. The Jets then drastically cut into the lead by halftime. After free throws by Cundiff, Heath and Ashley Roush cut the gap to 24-17, Roush made a put-back off a missed free throw to cut it to 24-19. Roush made a pair of free throws with 2.9 seconds left to bring Fairlawn within 26-23 at halftime. Jackson Center will finish regular season play on Saturday at home against Versailles and will open tournament play against Mechanicsburg on Feb. 19. The Indians are the Sidney Div. IV sectional’s No. 4 seed while Jackson Center is No. 11.